In 2008, Whisper, the Waves, the Wind was part of Memory Is Your Image of Perfection, an exhibition curated by Lucia Sanramon at the Museum of Contemporary Art San Diego (MCASD) which explored the subject of memory through connections, oppositions, and overlaps among the work of 14 women artists who live in or have been associated with Southern and Baja California. The work is one of several by Lacy that focus on aging, specifically its representation through media and public opinion. 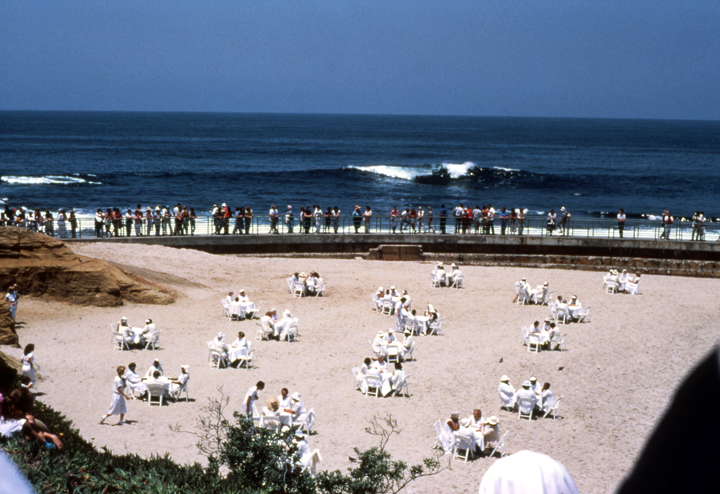 From 1983-1984, Lacy worked with a group of Southern California women over the age of 65 to produce a series of policy and media actions that would culminate in an ocean front performance for an audience of 1,000. During the performance, 154 participants sat at white-cloth covered tables on a beach in La Jolla discussing their lives, their relationships, their hopes and their fears. Audiences watched first from afar, as a sound score created by Susan Stone reiterated their conversations. Later, the audience was invited to stand around the tables for a closer listen and to experience a space of active contemplation that Lacy and the women had created. The structure of this tableau vivant was based on the populist theatre movement, which Lacy began incorporating into her practice as inspiration for a contemporary public performance. A portfolio of photographic prints documenting Whisper, the Waves, the Wind is part of the permanent collection of the Museum of Contemporary Art San Diego (MCASD) in San Diego, CA. Whisper, the Waves, the Wind exists as a film, a large-format hand-tinted photographic series, an accompanying sound track and other archival paraphernalia. It is available for exhibitions and private collections. Please use the contact section on this site for more details.